Wow. Insane. Awesome. Incredible. Amazing. Miraculous. Impressive. Wild. Crazy. Unbelievable. You wouldn't believe it if you didn't see it. 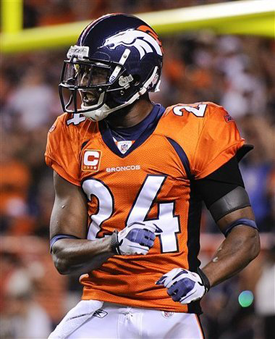 That all describes the Broncos big win on Thursday Night Football vs. the Jets. 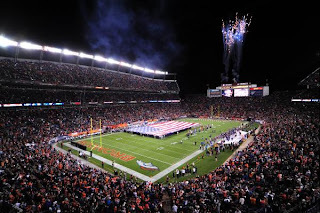 A game that was quickly heading downhill for Denver till their final drive in the 4th quarter that sealed the win, moved Denver up in the AFC West and sealed in Tebow's starting job for a little bit longer. 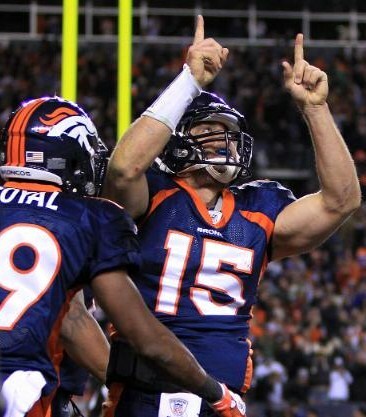 Denver, I do believe, has a new Comeback Kid... Tim Tebow. He mirrors a certain someone in that way and it NEVER ceases to amaze me and it never ceases to please the fans. 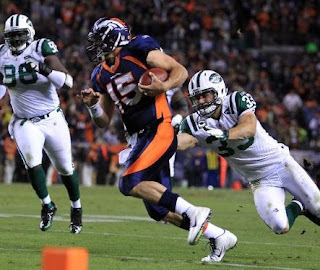 Granted the legendary Elway had a nice balance in his game but fact is Tebow is getting the job done and that's what they both have in common. They saved all the good stuff for last. Drives me nuts, I don't get it but it is so much fun to watch. If you really think about it, its very absurd. So absurd that nearly all game long we were getting punts that landed Denver in such great field position we should have been scoring TD's on them left & right. But no, we would send them punts in return (albeit, good punts that didn't give New York much of a shot at running them back). But then we are dealt a feat that only a handful of people could pull off and Tebow (thankfully) is one of them. 95 yards. Less than 6 minutes in the game. Denver got themselves a whopper. And the first play of that drive nearly ended the whole thing, as Tebow shuffled a pass to Eddie Royal while still in the end zone and Royal was thisclose to being tackled for a very unwanted touchdown by SS Jim Leonhard. 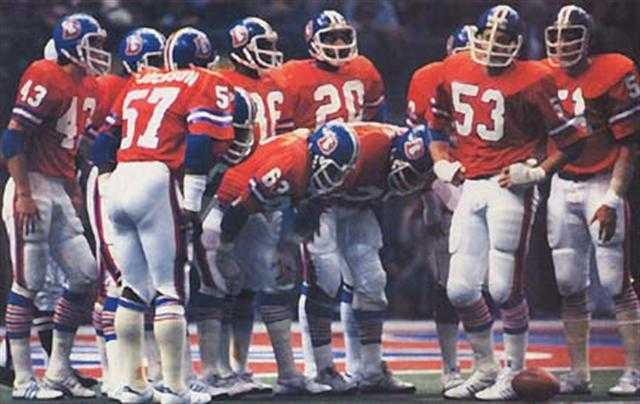 As Royal narrowly escaped the Broncos continued on and from there it was history going down right in front of you. That 95-yard drive that you had to see to believe it. Denver's offense managed to hang in the game and stand up to the Jets' defense who said they were prepared for Tebow's wild, unconventional ways but still got the shock of their lives and were left stunned. I bet not one of them slept on the plane ride home as they still couldn't believe what just happened to them; what Denver just dealt them. haha I laugh in the face of defeat. 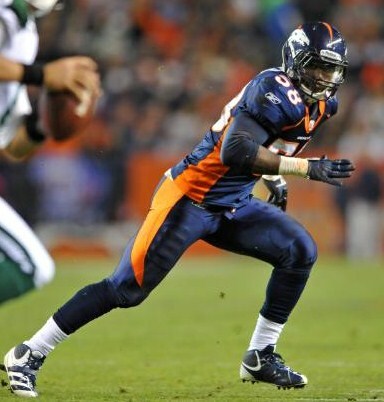 Statistically Tebow wasn't half bad as he completed 9 out of 20 pass attempts for 104 yards. Hey, its better than the 2/8 completions he had 4 days earlier. It's progress being made & his confidence being built even stronger. 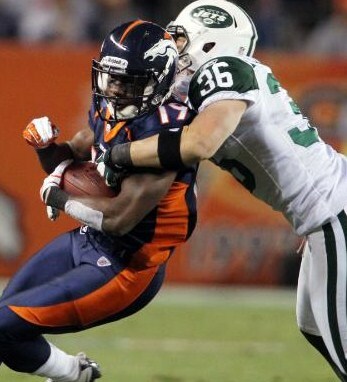 Tebow also led the rush attack with 8 rushes for 68 yards including his eye-opening game-winning 20-yard touchdown. Lance Ball & injured McGahee carried most of the weight and McGahee still looks good despite his hamstring injury sustained in Kansas City. Eric Decker wasn't thrown to all night long that I remember but rarely seen Demaryius Thomas caught 2 passes for 37 yards & RB Ball caught 2 as well for 26 yards. Royal had 3 catches for 15 yards. Overall, offense stayed with the game and prevailed in the end. That's all that matters. 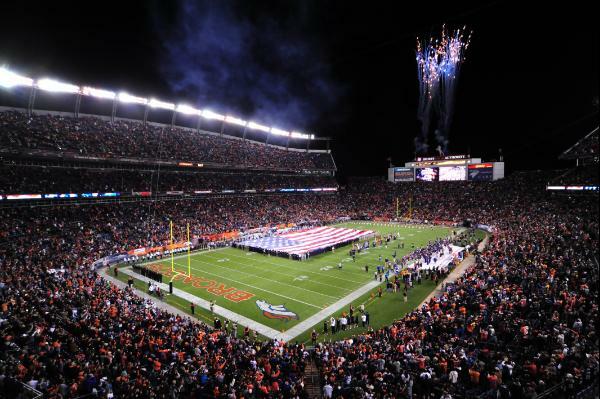 They kept fighting, kept believing and they came out victorious for Denver's first home game win since Tebow became the starting QB in early October. They are a fighting bunch... persistent and will do whatever it takes to get that win. Keep rollin' with the punches boys, I haven't admired this team like I do now in a very, very long time. I'm lovin' every minute of it. The anchor of this team and this game. Absolutely on target all game long and I couldn't be more proud of how far this defense has come along in less than a year (with a lengthy lockout). So impressed with how well our D stayed strong the whole game. They owned it. 1.5 sacks, 4 QB hits, 9 tackles, 1 assist and a forced fumble. He is rockin' & rollin' and I think we got a steal with this draft pick. Un-freakin-believable! The deadly duo of Von-Doom just keeps on packing the punches as they both had 1.5 sacks on Sanchez. Andre Goodman also had a big day as he picked off Sanchez for a Pick-Six, getting Denver's first TD of the game in the 3rd quarter and Cassius Vaughn recovered a fumble. Denver's D really came through for the team in the very last play of the game as Sanchez & the Jets were given plenty of time to rally a decent drive together to try & win the game. Very last play, WR Plaxico Burress, was waiting in the end zone for his miracle pass and was covered by 4 defenders... Defense won that battle and as they say, defense won the game in the end. Burress should've caught that ball and would have had he not been so well covered. 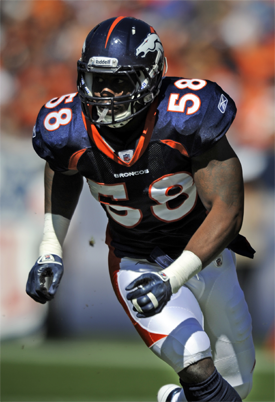 Mile High salute to our D. You deserve it, big time. 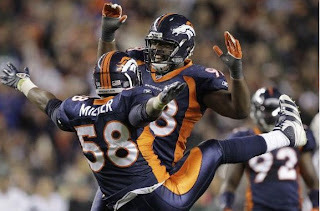 Defense had a very good night in the Mile High City, a night full of Mile High Magic. Punter Britton Colquitt has made quite the name for himself as he is one of 4 Broncos who are leading the polls for the NFL Pro Bowl in their respected positions. 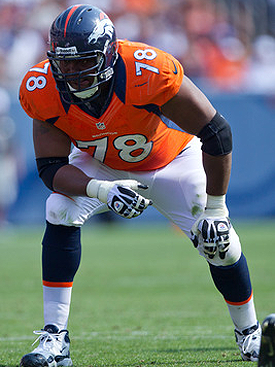 Daniel Fells is reported to have been the only Bronco who was injured in Thursday night's game with a concussion. 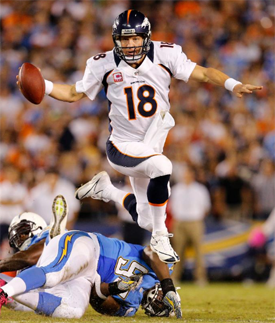 He has to pass his baseline tests in order to be cleared for Denver's next game against San Diego. I'm proud to present to you plenty of highlights of this great game. Enjoy! Not a problem Princess and thanks for the great write up. Chargers lose(1 game down). Raiders win(one game up). Rooting for Cutler again next week as it's Chic@Oak. I gotta say I like rooting for Jay again. 80 finally gave up on McCluster. Good to be in the hurt again for playoffs. I have been destroyed by injuries so far, Austin and Maclin both injured, I now have no good wrs, lucky I got some production from Washington, but yeah struggling. Some more of Decker's missus, is it just me or do you hate her pants? What I want to know is where is this? Tebow sets his feet and deliverys strikes, his passes are good and he spins the ball cleanly. Though I will say he had an awesome pocket and heaps of time to throw. We cut Orton, very classy move to allow him to go to a team with an injuried QB. Good luck Orton.